When it comes to pancakes, everyone seems to have an opinion. I think, perhaps, only pizza is more debated. However, today isn’t about pizza (so please remove your boxing gloves Frydae Friends, we’ll save that fight for another day). Growing up, pancakes (and more specifically, peach pancakes) were a staple weekend breakfast at my house. While my mom did 99.9% of the cooking in the house when I was young, my dad took ownership of the pancakes. His recipe used Bisquick and it’s standard pancake recipe, only adding a can of peaches and some of their juices. He’d use our food processor to slightly pulse the peaches into the batter so there would still be some peach chunks in each pancake. The extra liquid in the batter made his pancakes a bit thinner too which made the pancakes just melt in your mouth when you ate them. Because of this, I grew up somewhat of a pancake snob. Yes I know, a can of peaches is by no means gourmet, but they made a world of difference in my nine-year-old mind. I always felt bad when I’d have a sleepover at a friend’s house and their parents’ would make us pancakes in the morning. Inevitably, they’d be these thick and cakey monstrosities that no matter how much syrup you’d pour over them they’d still be dry as toast. Id’ of course force myself to eat a healthy stack of them out of politeness, but all the while I’d think “man, my dad makes wayyyyyyyy better pancakes” the whole time. 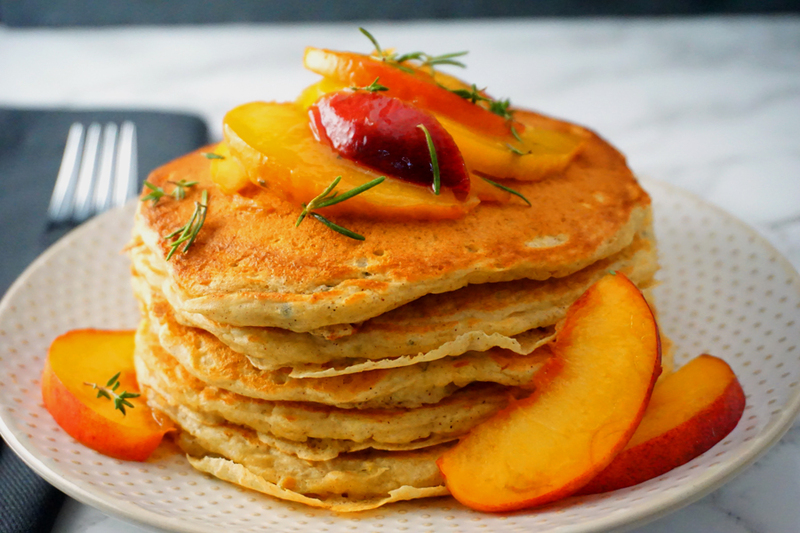 When I grew up and started dating and eventually marrying my husband, I quickly converted him to the ways of peach pancakes (I’m almost positive my sister did the same for her husband as well). 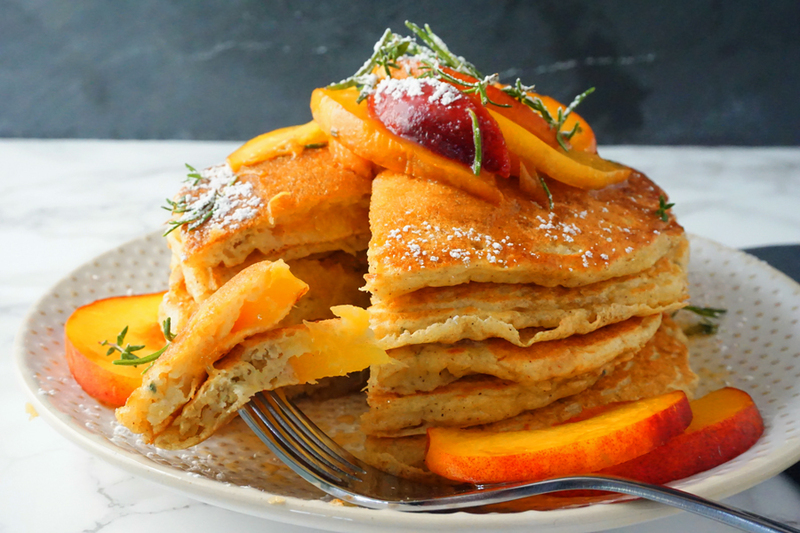 For us, peach pancakes were a way of life, so today I’m sharing with you a jazzed up version of this childhood staple. 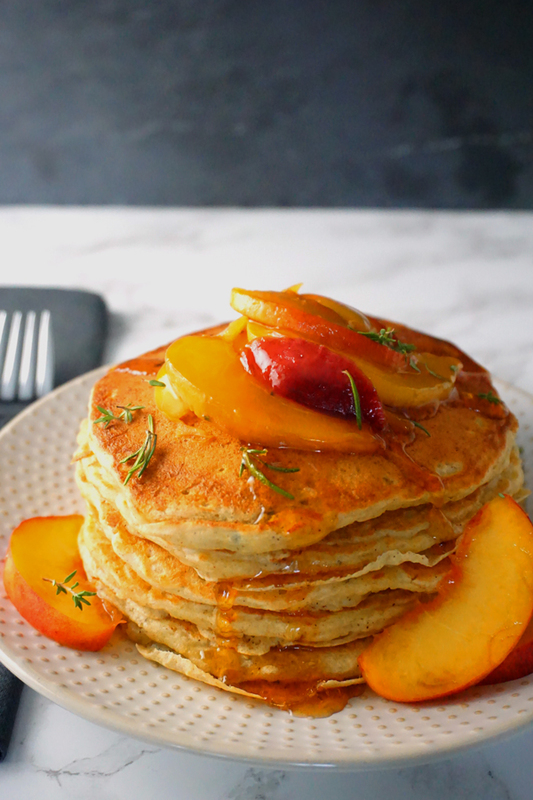 This recipe uses fresh, ripe peaches and buttermilk to make fluffy, light pancakes and for the grand finale tops each stack with warm, sautéed peaches infused with vanilla, molasses and a hint of rosemary. Paired with a healthy pour of pure maple syrup these pancakes will turn anyone into a morning person. What about you? Did your dad cook when you were growing up? Leave me a comment below telling me what his house specialty was. I love hearing from you all and do my best to respond to every comment. 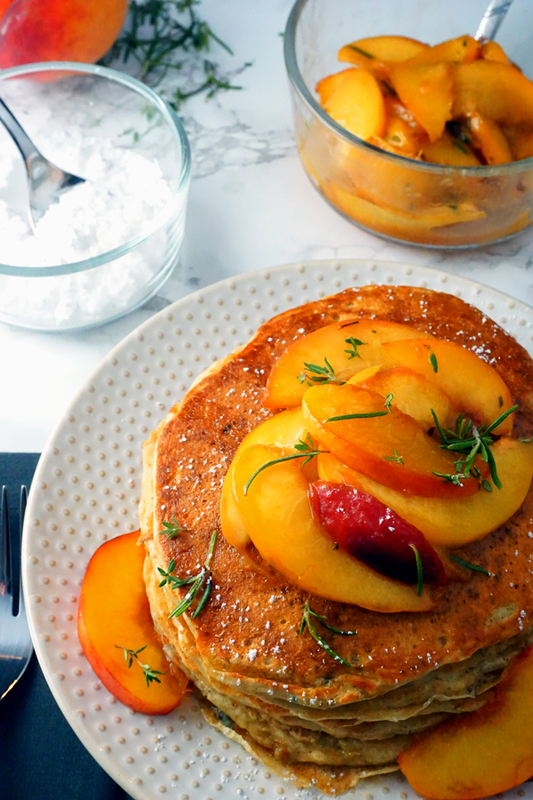 Also, if you try this buttermilk peach pancake recipe, please give the recipe a rating and don’t forget to also tag me on Instagram (@frydaeblog or #frydae) with your results—before or after devouring because sometimes I know the “gram” has to wait. 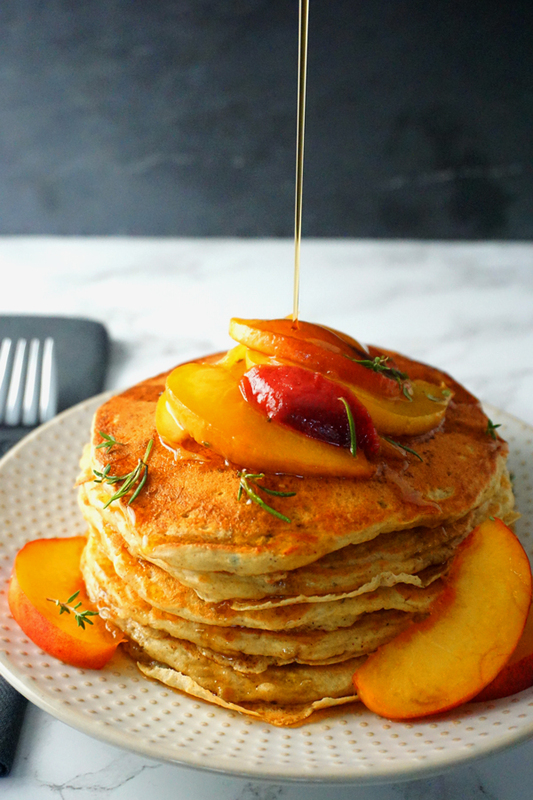 Fluffy, sweet buttermilk pancakes loaded with fresh peaches and then topped with sautéed peaches infused with a hint of woodsy rosemary and vanilla. Preheat a lightly greased frying pan or griddle over medium-high heat (about 350°F). In a food processor, pulse half of the sliced peaches for a few seconds. You want there to be some larger pieces remaining. 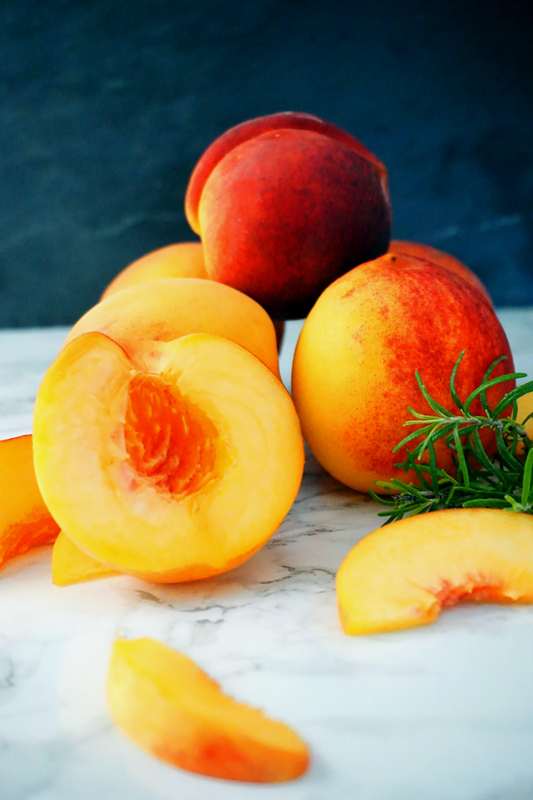 Remove peaches from the food processor and into a large mixing bowl. Next, add melted butter, egg and vanilla extract and whisk until combined. Add 1 cup of the buttermilk to the bowl and then begin to mix in remaining dry ingredients. Stir to combine and then gradually add additional buttermilk (up to 1/2 cup) until thick, yet pourable batter forms. You want the batter to naturally spread out on its own when it hits the hot griddle. Now, pour a generous 1/4 cup of batter onto the griddle. Let cook for a few seconds and then lay 2-3 of the reserved peach slices onto the pancakes. Let cook for 2-4 minutes, or until bubbles rise to the surface and the bottom is golden brown, then flip. Continue to cook until the second side is golden—about 2-3 minutes. Remove pancake from griddle onto an oven-safe plate and place into a warm oven (170°F) while you cook the remaining batter. As you cook the remaining pancakes, prepare the warm peach sauce. Melt the butter in a pan over medium-low heat. Once melted, add peaches, sugar, molasses, vanilla and honey. Stir to combine and then sprinkle in rosemary and thyme. Continue to cook until peaches soften and herbs are fragrant. Keep warm over low heat until ready to serve. 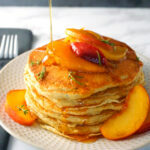 When sauce and pancakes are ready, place a stack of pancakes onto a plate and top with warm peaches. Serve with maple syrup, powdered sugar and/or whipped cream. Thank you, Gerda for the sweet comment! Glad you’re enjoying my little corner of the Internet. 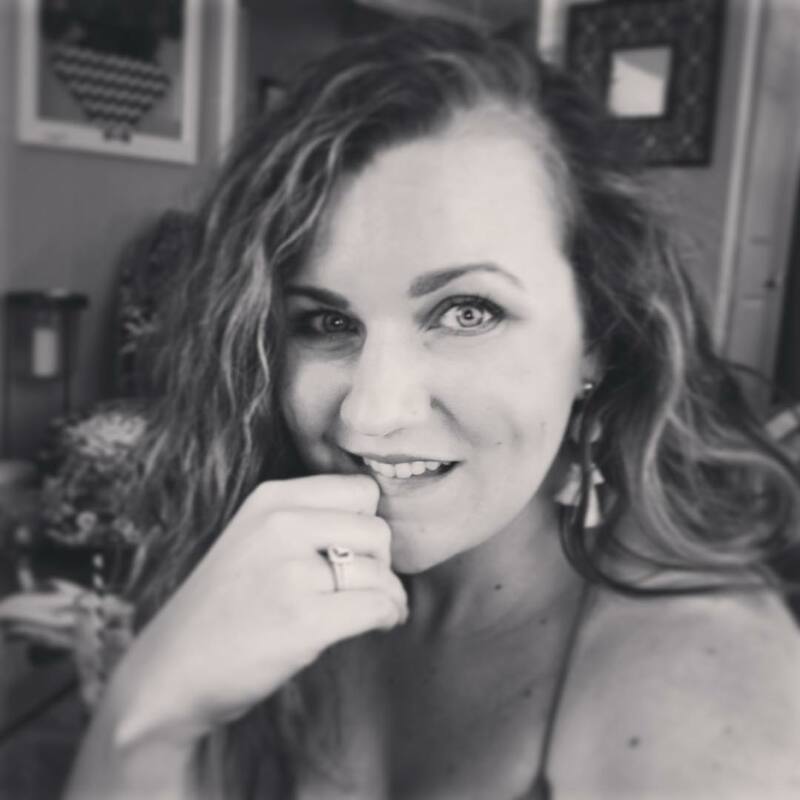 Welcome to Frydae—a food blog by me, Lauren Habermehl. I created this blog as a space where my passion for great food could come alive. Thanks for visiting! Show your friends what you're cooking. That way you don't have to share—they can make it themselves.